Learning how to make “faith choices” to follow God’s leading, regardless of how we feel, what we think or what the circumstances are, is the key to our entire Christian walk. 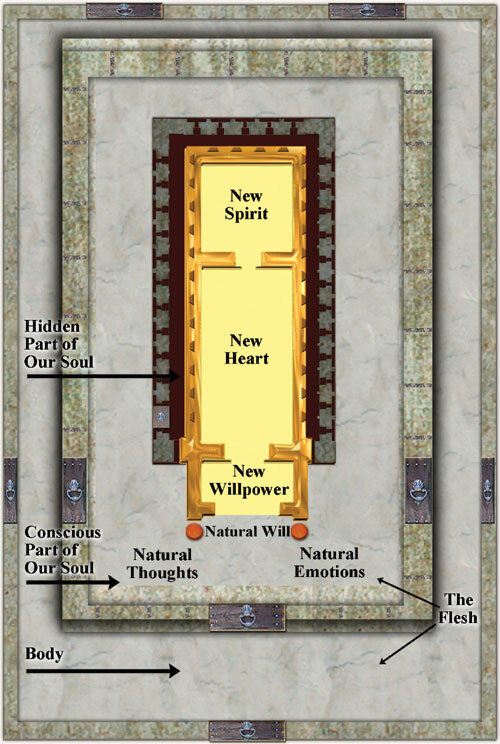 Last month, we presented some charts of Solomon’s Temple that depicted the architecture of man. 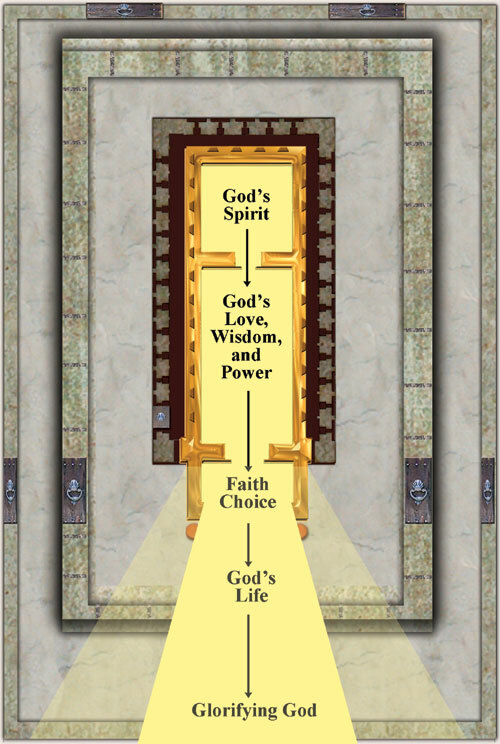 We showed these charts primarily so viewers could see what the “old man” is (i.e., our flesh, the grey area) and what the “new man” is (i.e., the Spirit, the gold area). We also wanted to point out the area and the importance of our willpower (i.e., our moment by moment choices). Faith, itself, is simply a series of ongoing choices. Scripture tells us that when we are “born again” we not only receive a new spirit and a new heart, we also receive a new supernatural willpower-a supernatural empowering by the Holy Spirit called in the Greek, dianoia. As we saw last month, this is the authority and power of Christ to do things we don’t naturally feel, don’t want to do and don’t think will work. This is His God-given authority to set ourselves aside and choose His will regardless of our own thoughts and emotions. This kind of a choice enables us to totally give ourselves over to Him and do what He is calling us to do-even if it’s the last thing in the world we “feel” like doing. This is the heart of Biblical Christianity. God has all the Love, wisdom and power we need. However, the choice to be a cleansed vessel through which He can work these things is always ours. Our willpower has two parts to it: 1) We have God’s supernatural will and power, which gives us His counsel as to what His will is and His power to perform that will in our lives; and 2) We also have the free choice to either follow what God has shown us and depend upon His ability to perform it in our lives or we can choose to follow our own desires and trust in our own ability to perform it in our lives. It’s interesting because we are so programmed to feel everything we choose. And when we don’t feel our choices, we don’t think they’re genuine. However, in God’s Kingdom this is not the case. Born-again believers possess the authority and power of God to go against what we naturally think and feel. God, then, will take it from there. Now, certainly, non-believers have a choice to decide what they want to do. But none of them have the authority to choose to go against how they feel, what they think, and what they desire, because they don’t possess another ­power within them to perform anything different. Christians, on the other hand, do! Therefore, Christians are the only ones who possess a supernatural power within them to perform something different from what they naturally think, feel, and desire. And this is what makes us so different from non-believers, who don’t really have any other choice but to follow what their flesh is telling them (i.e., they must go with the flow ). They really don’t have a free choice! Even though they might desperately want to change and go a different direction, they are unable to. They don’t possess the authority or the ability within themselves to do so. Thus, in reality, they don’t have any other choice but to follow what their own thoughts, emotions and desires are telling them. Christians, however, do! Because of the Spirit of God in us, we have His authority to say, “Not my will but Thine,” and then His power to give our negative thoughts and emotions over to Him. Thankfully, we don’t have to be carried on by the tide of emotion like non-believers. We have Christ’s authority to choose His will and thus, His power to perform that will in our lives. Philippians 2:13 tells us that it is God who worketh in you both to will and to do of His good pleasure. And also in 1 Corinthians 7:37, it assures us that we have power over our own wills. Nine years ago, our precious son Chip, only 39 years old, went home to be with the Lord. He had simply gone out for a jog one Saturday afternoon and ended up dying from a massive heart attack. He left behind a beautiful young wife and two babies. Of course, the devastation for all of us was beyond description. Chip was the hub around which all of our family lived. Just 20 days after Chip passed on, there was a retreat scheduled in Chicago where I was to speak. I couldn’t get out of it because it would have been too short of a notice to cancel. On the airplane going to Chicago, I told God I had absolutely nothing at all to give these women. I was grieving, totally empty and a basket case. How could I speak and how could I be full of the Spirit when my heart was broken? I didn’t understand why God had allowed Chip’s death. (Kids are not supposed to die before parents.) I was literally coming apart at the seams. But, I knew the Lord must have a purpose for all of it and I was willing to simply be an open vessel for Him. So, I made the faith choice to get clean and leave all my questioning, my brokenness and my grief at the Altar and unconditionally trust Him. On the plane I opened up the file for the seminar and immediately noticed a letter from a woman named Shar, whom I had corresponded with a couple of times. Three years previously, Shar had lost her oldest son in a horrible automobile accident. He was only 20 at the time but loved the Lord with all his heart. Shar had been a Christian for years, had taught numerous Bible studies, and had exhorted many others to know Christ. But, losing her son had absolutely crushed her. She could not understand how a loving God would allow such a tragedy to happen to a family who loved Him so much. The more she questioned God, the more doubt and unbelief grew in her soul. Eventually, Shar found herself at the lowest point in her walk with the Lord, totally defeated and despairing. When she prayed she couldn’t hear His voice. When she read the Bible, the enemy twisted its meaning to convey something totally opposite from what was intended. And, when she attended Bible Studies, she didn’t get anything out of them. So she just stopped praying, stopped reading and stopped going. She totally gave up! She felt God had covered Himself with a cloud and had abandoned her in her deepest need. Shar became so depressed that she wanted to die. She no longer cared about anything or anyone. She dropped out of church, stopped seeing her friends and quit all social activities. The coming seminar happened to be at her home church. Suddenly, I knew why God was sending me there. The Lord, in His Love, had arranged this particular weekend not only to minister to me in my own brokenness, but also to minister to Shar. He wanted to show her just how much He loved her, and to what extreme He would go to communicate that Love to her. I had last corresponded with Shar about a year before Chip died. In my letters I encouraged her as much as I possibly could and included passages like Romans 8:28: “...all things work together for good to those who love God.” However at that time, I really could not identify with her because I had never walked in her shoes. One year later, however, things radically changed-Chip died. I now understood exactly how she felt. When I arrived in Chicago, I immediately called Shar and asked if she was going to the meeting that night. She said no and explained why. Then I told her about Chip. She had not heard. She began to cry. I, too, sobbed. But I told her that God had arranged this weekend for the both of us. He wanted the two of us, that very night, to relinquish our sons over to Him, laying them at the Cross. Shar came. And, after the seminar was over, the two of us went outside, sat under the stars and out of obedience (because neither of us felt like it) gave our sons back to the Creator. The love that flowed between us and the Love we experienced from the Lord at that moment is something I will never forget. It was Christ’s Love, His life, flowing between us, ministering to us, encouraging us and lifting us up. We felt Jesus Himself had come and touched us. Shar is now back in church and fellowshipping and, the last I heard, doing very well. God allowed still another very difficult night season in her life but from what I hear, she has received it from God’s hands and is glorifying Him through it. Faith choices allow us to embrace whatever trials God sends our way and yet, still be able to display His Love in midst of them. To be continued next month: “Not my will, but Thine.” This article has been excerpted in part from Nan’s new book Reflections of His Image: God’s Purpose for Your Life. November 2007 Personal Update News Journal.